What is there to say about winter fruit in Colorado? Not much. There’s not much of anything, and no effusive words of praise. We get the out of season berries shipped in from a variety of southern climes, most without much flavor or texture. Still, they can work if you need them to. Apples. Citrus, with the occasional sighting of Meyer lemons or Cara Cara oranges, both able to stop you in your tracks, well, at least me. Then there are pears. Red, Anjou, and Bartlett. Organic or not. (Can you tell? I want the Farmer’s Market back so badly I could almost cry.) Fruit is good for you right? So I keep buying it. I like pears. I’m so over pears right now…..oooof. There they were, sitting in the bowl, in all their mottled green-y pear-shaped sadness wonderfulness (try to stay positive). I have to do something with them. Again, stand in front of baking cabinet, flour, sugar, vanilla,pecans, brown sugar, boring, boring, boring. Wait. 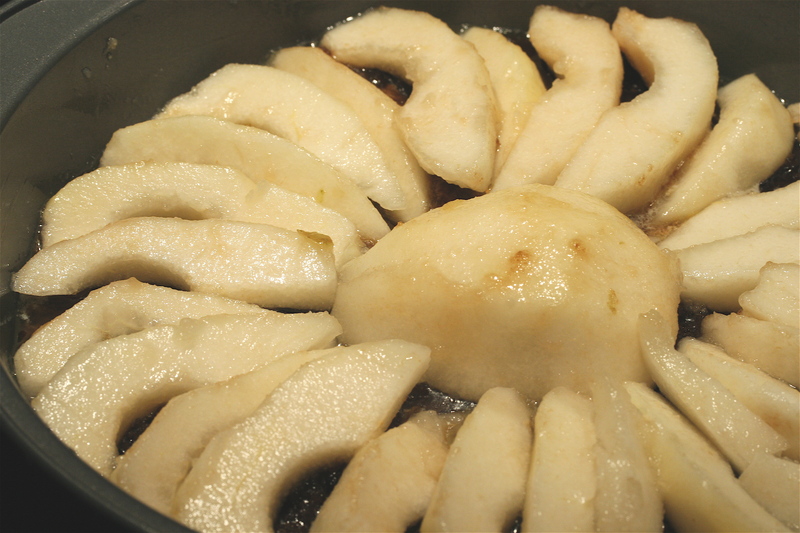 Brown sugar and Butter…pears, vanilla cake, pear upside down cake. Upside down cake, the standard, pineapple, is perfection. I have adapted that recipe to so many different fruits, fruit combinations and nuts I can’t tell you. I can’t believe I forgot about it. I won’t forget again. 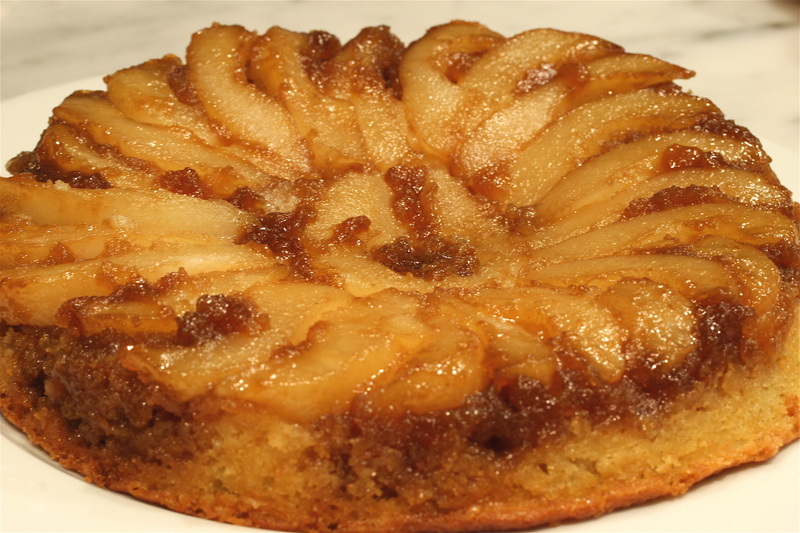 This pear upside down cake is not a knock your socks off, push you over kind of thing. It’s a gentle shove, a sit you down in the softness of the big comfy chair kind of thing. Delicate flavor, yielding fruit, with a bit of lushness from the brown sugar. The cake has a sturdy crumb that gets better every day as it soaks in more moisture and settles into itself. It’s not loud, it’s quiet, but deeply satisfying. Pretty enough to serve for company and dressed up with some creme anglaise or maybe ginger ice cream with a slight grate of fresh nutmeg, it might be downright elegant. Either way, homey comforting upside down cake or elegant dessert, I think you’ll be happy. Go..go on, you know you want to try it. arrange pears over brown sugar, cut side toward pan. 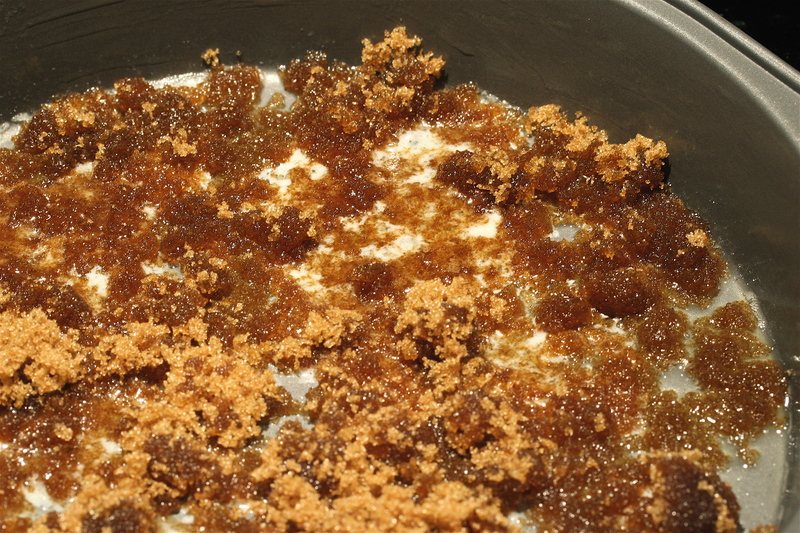 Cream the remaining 1/2 cup butter with the granulated sugar, egg, and vanilla. Blend in the baking powder and salt add the flour alternately with the milk, blending well. Pour mixture over pears evenly. Now I’ve broken my rectangular glass dish and used a 9″ round cake pan. This recipe makes too much batter for that size pan. If you have a larger round pan you might be fine, but I wouldn’t use a springform pan as the butter/brown sugar mixture is likely to leak. 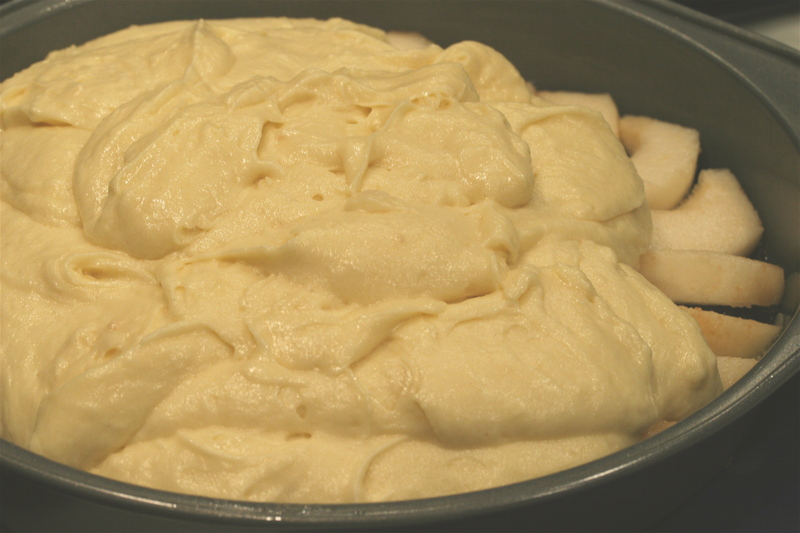 Any remaining batter can be used for either a few cupcakes or a thin layer cake. Just shorten the baking time. Bake at 350°F for 35 minutes or until center of cake tests done. cant wait to try this! Ive done the classic pineapple upside down cake… I like pineapple .. LOVE pears! Thanks! used a pyrex dish. The cake wasn’t cooked through at 35 minutes, so I covered with foil, lowered the temp to 325* and let go for another 10 minutes. Looks lovely! cant wait to dig in!